Waaaaaaay back in the 1980s (it is really scary that the 1980s now seem like a historical time period. Sigh) I used to travel a lot. I thought nothing about leaving New York City (where I lived at the time) and jumping on a plane to…somewhere. Vienna? Check! Paris? Check! San Francisco? Check! London? Check! Florida? Why not! Italy? Absolutely! And so on. 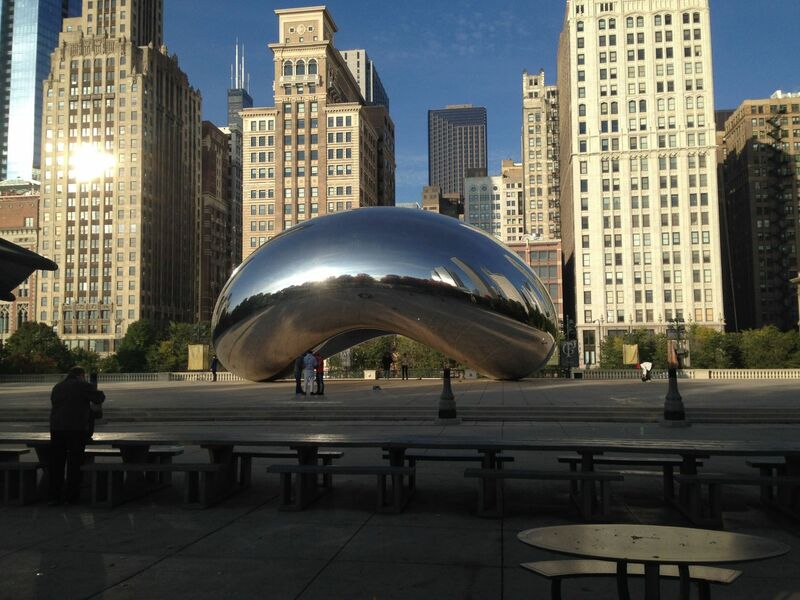 Annually, I made a trip to Chicago. 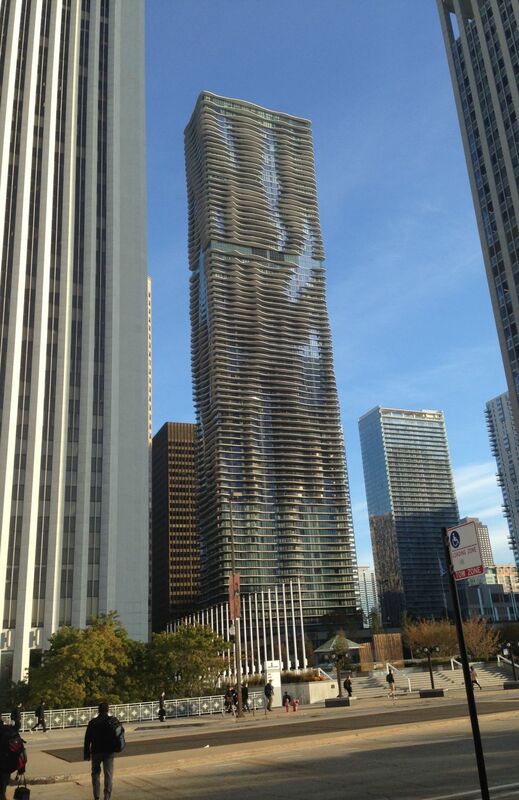 You see, I am a fervent fan of Frank Lloyd Wright and Chicago is the epicenter of Wright. 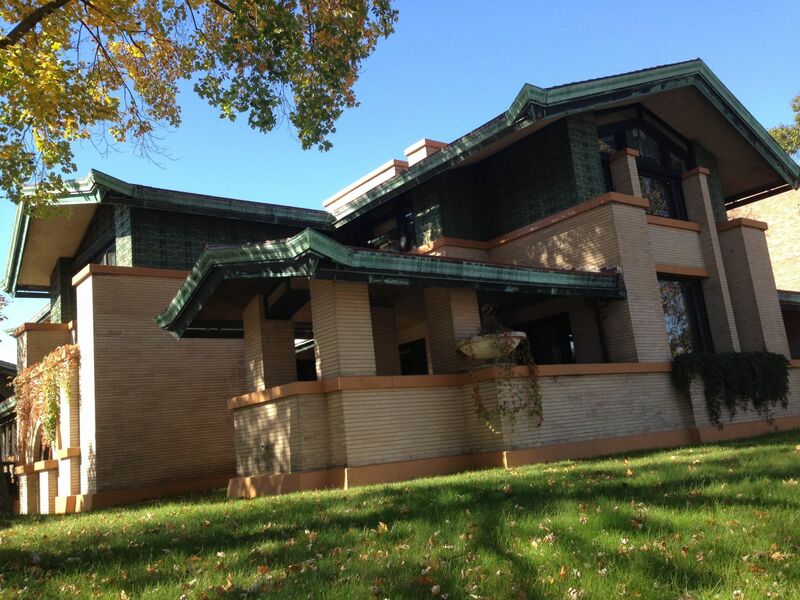 Every spring there would be (and still is) a Wright-Plus tour of his home in Oak Park (a residential neighborhood just west of downtown), other Wright-designed structures (whoee! ), and homes by other architects (cool, too). Ahhhh, those were the days, as I rarely travel today. You see, I really LOATHE the whole security nonsense now associated with getting on a plane. Once, I had my mouthwash confiscated. Why? The plastic bottle was larger than new regulations allowed. Since when did mouthwash became a terrorist weapon? 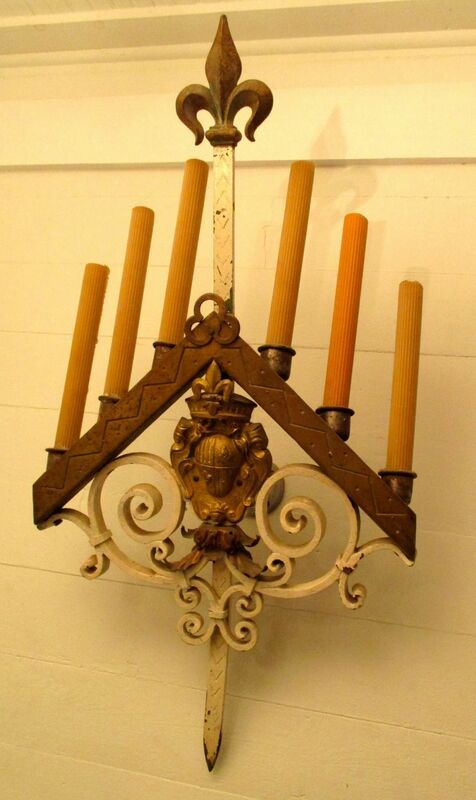 Anyway, because I make my living restoring vintage lighting, I am always scanning the internet for great old lights. Almost always my purchases are shipped but sometimes a light fixture has to be picked up. On such occasions I am happy to make a road trip (no security checks!!!!). It is great fun running away for a brief period, and I enjoy experiencing towns I have never seen before, finding wonderful local restaurants, listening to audiobooks while driving, and staying in motels. Regarding the latter, I am a motel snob. Yes, its is true. I used to hyper-focus on slightly faded motels from the 1940s, 1950s, and 1960s. Such motels are not found along the Interstate highway system but are rather along the old Route highways pre-dating the Interstate system. Such motels were IT when they were built but were instantly eclipsed once a nearby Interstate Highway opened. The problem is that with each passing year these time-capsule motels become ever more seedy, and it became an ever rarer event when I opened a door to my bedroom for the night and felt excited. No, increasingly I emitted a moan. Occasionally I emitted a groan. A component of seeking such motels was their cost: not too much. I recall the long-lost days when one could find such a motel for $20 a night. Then it crept up to $30. Then higher and higher until about $60 was the norm. Hummm. I much preferred $20. While I am often extravant with money I do have a genetic Scottish predisposition to frugality. However, something about my DNA is corrupted because frugality is more the rare than the norm with me. Last year, after a particularly depressing motel room (but with an incredible Atomic-age neon sign out front! ), I made the painful decision to abandon my decades-long love affair with Slightly Faded Retro Motels. Their replacement? Hip & New. I know, a sacrilege! Today, I love checking into an $80 – $120 a night motel owned by a corporation with a zillion identical motels across the nation. But this is where my snobbery is relevant. It used to be that ALL motel decor was designed to NOT OFFEND ANYBODY. Hence, they were as neutral as possible. Picture a lot of beige, neutered patterns on all fabrics, and sorta-kinda-somewhat traditional furnishings. In short: Very Dull. Oddly, while motels went to great lengths to not offend anybody, I was offended by this deliberate focus on banality. I am uncertain when, but it seems that in the last decade all this had changed. Actual STYLE and FLAIR and BOLDNESS has overtaken BANALITY. As I am nothing but intensely visual this sea change thrills me. A case in point. 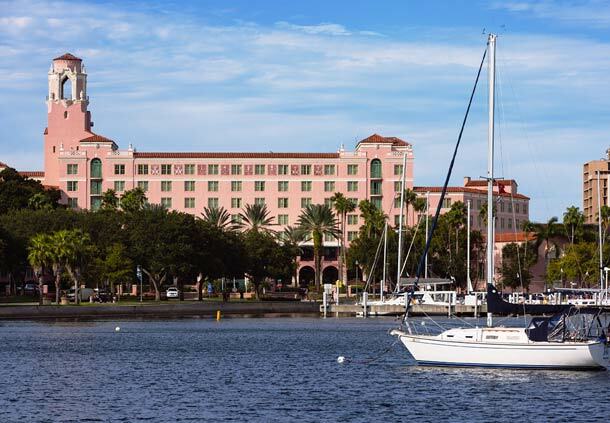 I came of age in St.Petersburg, Florida, and had a passionate love affair with the Grand Dame of 1920s downtown hotels: The Vinoy Park Hotel. In the 1970s however this elegant Spanish-Revival pile was experiencing a catastrophic decline, and it closed. Fast froward to 1992, and after being repeatedly threatened with demolition, it was…restored! Incredible. I happened to be in the city at the time so promptly made a reservation for dinner in what I had known as the Pompeii Dining Room. ABOVE: The pink pile: The Vinoy Park Hotel. 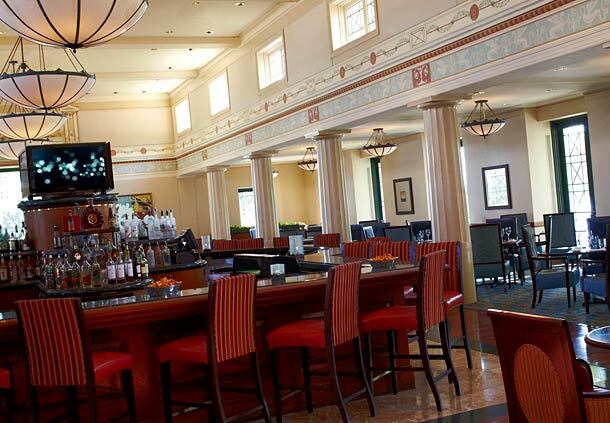 ABOVE: The Pompeii Dining Room of the Vinoy Park Hotel. The above image dates from circa-1950. In the 1970s the room was virtally unchanged. When the hotel closed in the late 1970s all the interior fittings were sold off. I was ecstatic to purchase draperies from the Pompeii Dining Room and Grand Ballroom, as well as several lighting fixtures. ABOVE: The incredible and distinctive Pompeii Dining room was, after the hotel’s rebirth, neutralized into the banal Marchard’s Dining Room. WHY? Even the new name is banal and means nothing. WHY? 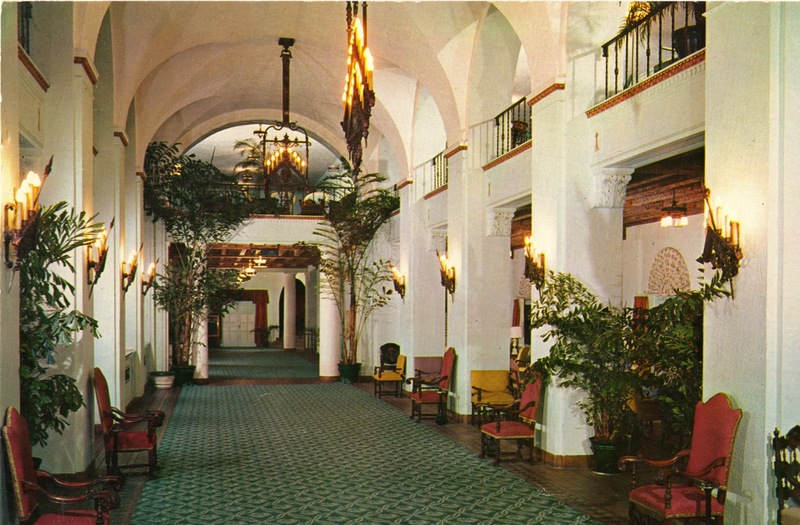 ABOVE: The grand lobby, another circa-1950 image. You see the wall sconces? ABOVE: ….I have one right next to me as I write this. It is the only possession I retain from my very first apartment at the tender age of eighteen. The sconce is BIG. I love it. ANYWAY, back to my being a motel/hotel snob. When the Vinoy Park repopened in 1992 I was crushed with bitter disappointment. 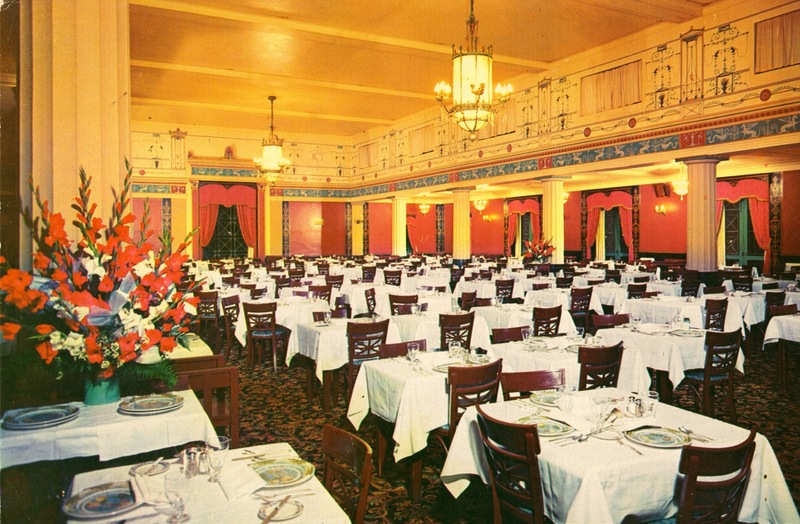 There was NOTHING left of the original decor, even through the extraordinary chandeliers from the Pompeii Dining Room and Grand Lobby had survived the lost decades. The whole had been redone Very Beige and with Golden Girls furnishings. 1) Why are the chandeliers so high up? They would look better hanging lower. 2) Why doesn’t the dining room look this hip? 3) Why hasn’t the dining room been renamed the Pompeii Dining Room? 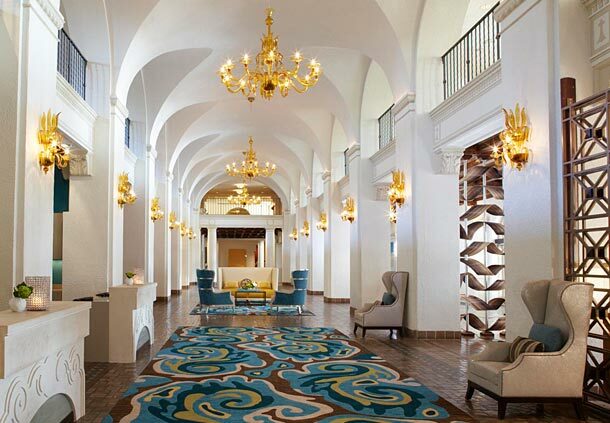 ABOVE: A room at the Vinoy Park Hotel. Such a decor would have been unthinkable twenty years ago. 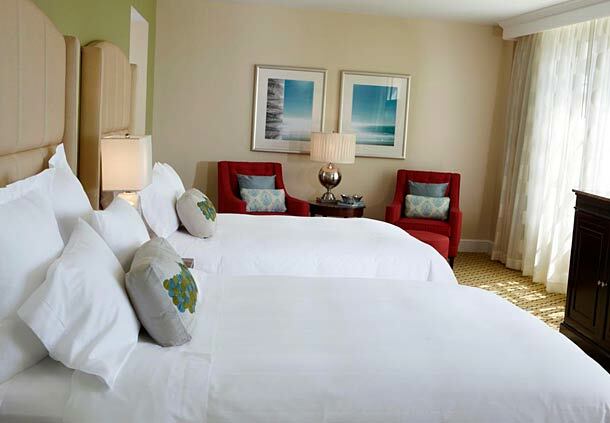 The above two images are examples of the aforementioned sea change in hotel/motel design, and this is an aesthetic I lust after when booking a Holiday Inn or Comfort Inn or Hampton Inn. On the trip to Chicago I stayed in three different motels. Tragically though, the first two had but glimmers of Hip Style and, although I cannot explain why, I am deeply affected by my immediate environment. In short, when I am surrounded by Style I feel better. But, it is hit or miss, as I have discovered, actually finding a Hip Style motel. One can stay a night at X Inn and discover Hip Galore yet the very next night one can book at the same chain and find….a late 1990s beige aesthetic. Really, this is all quite vexing! ANYWAY, one of the things I do when come into an unknown town or city is to ask a local: where is a good place to eat? In Jacksonville, Illinois, I asked the the proprietor of the Antiquarius antique store this question, and he replied: Schiraz on the town square. So I drove the few block over, and was gobsmacked when I entered the restaurant. Never had I seen a ceiling SO high in so narrow a space. Three stories above my head! Wow. WOW! I just stood there awestruck. 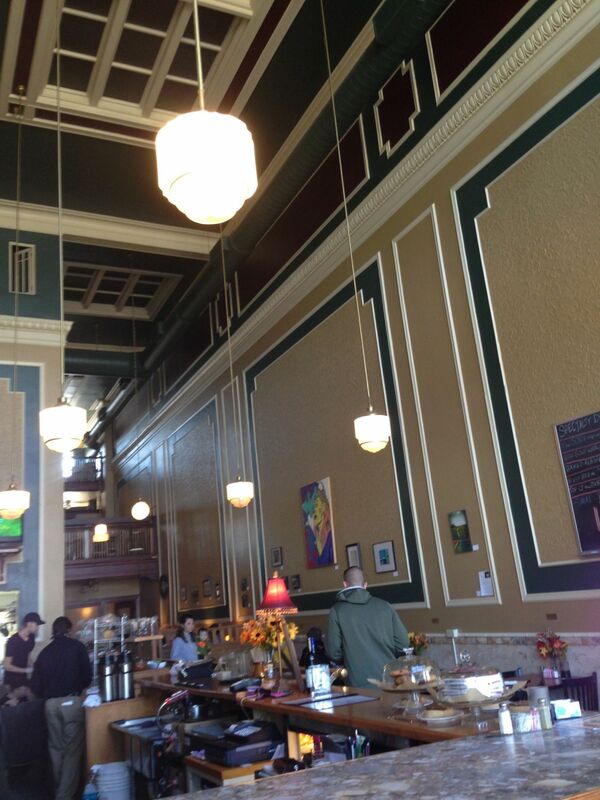 The place was originally a bank, and, sadly, the numerous skylights were all blacked out. I ordered a Sanfe Fe salad (very good) and the waiter was nicely attentive. Out the window I enjoyed the view of the town square. All in all, the perfect unexpected lunch. Me happy. ABOVE: Schiraz restaurant in Jacksonville, Illinois. In person the ceiling height is breathtaking. Later in the day I was in Springfield, Illinois, and happily driving along when I slammed on the breaks. I was RIGHT next to a house by Frank Lloyd Wright! I completely forgot that the incredible Dana-Thomas House was in Springfield, even though I had toured the house in the late 1980s just after a massive restoration by the state. ABOVE: The Dana-Thomas House by Frank Lloyd Wright. I mean, wow. The house was not open the day of my visit, so I parked and walked around the house. I remember it being so huge, but my sense of scale has been distorted by the titanic-sized Cross House, and the Dana House seemed, relatively speaking, sorta modest. The house has always been oddly located. It is right against a railroad track, and the houses across the street are, and always have been, quite modest. Susan Dana had grown up in a house on the same site, and when she decided to expand the family home she requested that Wright retain the original structure. Today, wholly buried in the Dana House, is the original home. It did not occur to me to appreciate the wonder of the Clouds construction, it was only while preparing for this post that I read up on the Cloud. I wish I had done so before seeing the Cloud as my appreciation, which was considerable, would have been much stronger, for not only is Cloud Gate a provocative work of art but it is also a miracle of construction. (there is not a single visible seam in the mirror-like surface). 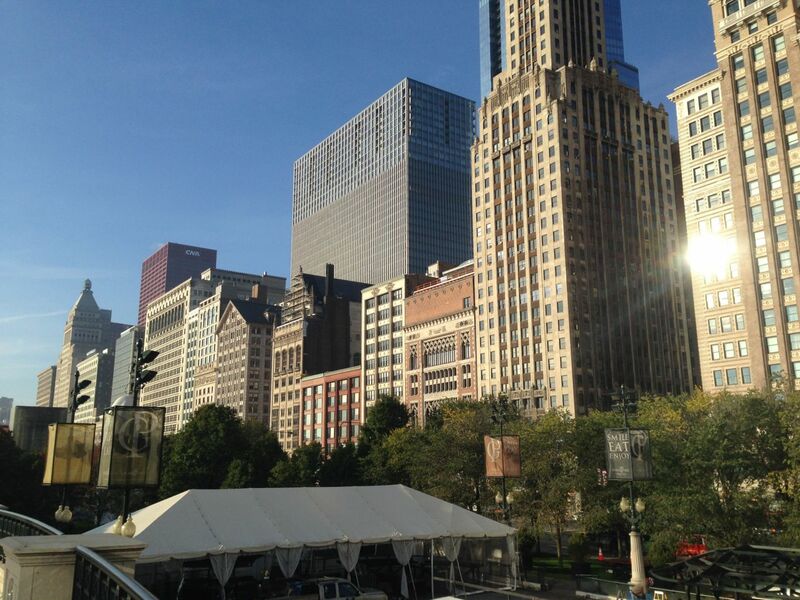 ABOVE: Fewer things give me more pleasure than a good skyline. ABOVE: Your basic tall box…with a twist. Then I walked over to the famous Auditorium Building by Dankmar Adler & Louis Sullivan. 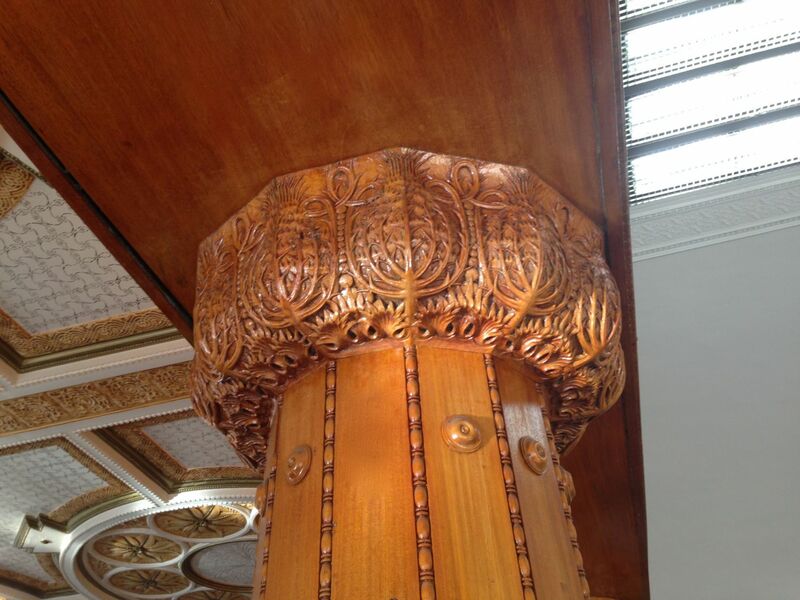 When he was a young pup, Frank Lloyd Wright worked for Adler & Sullivan, and right in the Auditorium Tower (see below). ABOVE: The Auditorium Building by Adler & Sullivan, 1889. 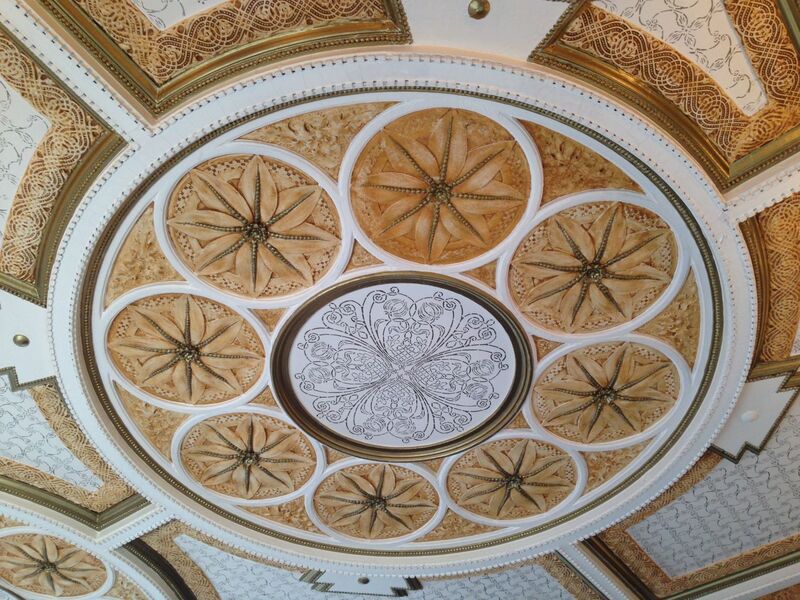 Adler was an engineering wizard, and Sullivan a brilliant artist who created extraordinarily luscious interiors. The two were a perfect team, and world famous in 1890. A few years later during a national economic crisis, Sullivan left Adler, and began a tragic downward spiral into alcoholism and poverty. He eventually lost everything, and spent his last years living in a single room. To his great credit, Wright (not without his own difficulties, but whose fame eventually vastly eclipsed Sullivan’s) always treated his former mentor with great respect. A nice story is when a very aged Sullivan was at a gathering at Wright’s home, Wright spoke to his former boss “in tones of such deference and affection [that Sullivan] came out of his somber silence and knew himself to be once more loved, revered” – as noted by Pauline Schindler. Lovely. 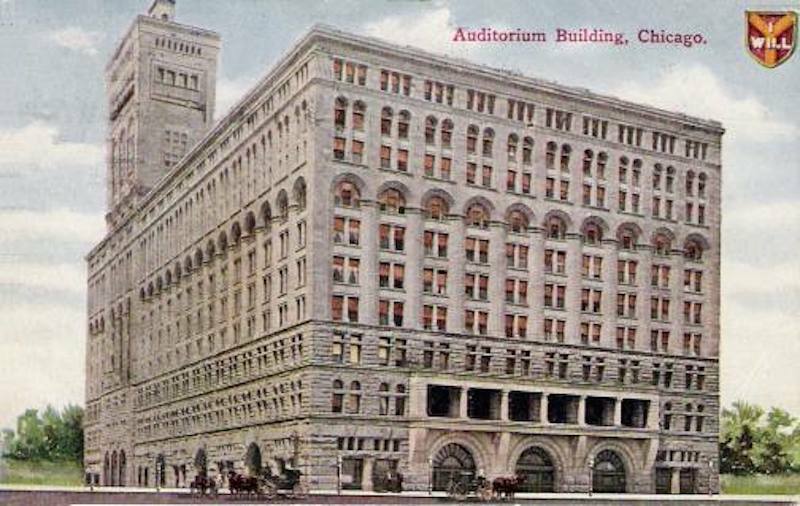 ABOVE: The Auditorium Building contains the famous Auditorium Theater. Less well-known but no less dazzling is the petite Ganz Hall, tucked away on the very upper levels of the building. Wow. Wow! WOW! ABOVE: The Auditorium Building, Ganz Hall. 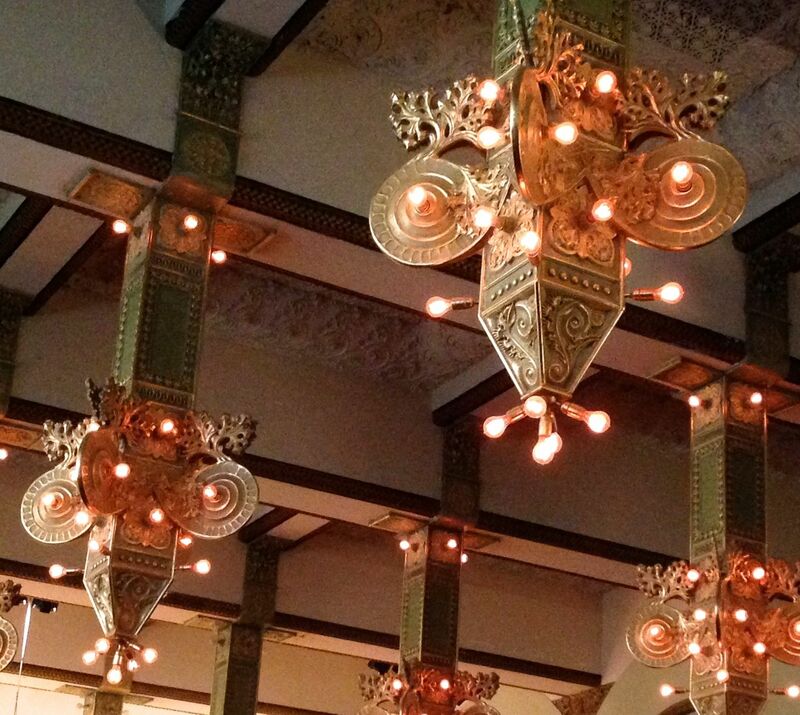 Never in all recorded history have there been lighting fixtures so astounding. ABOVE: The Auditorium Building. 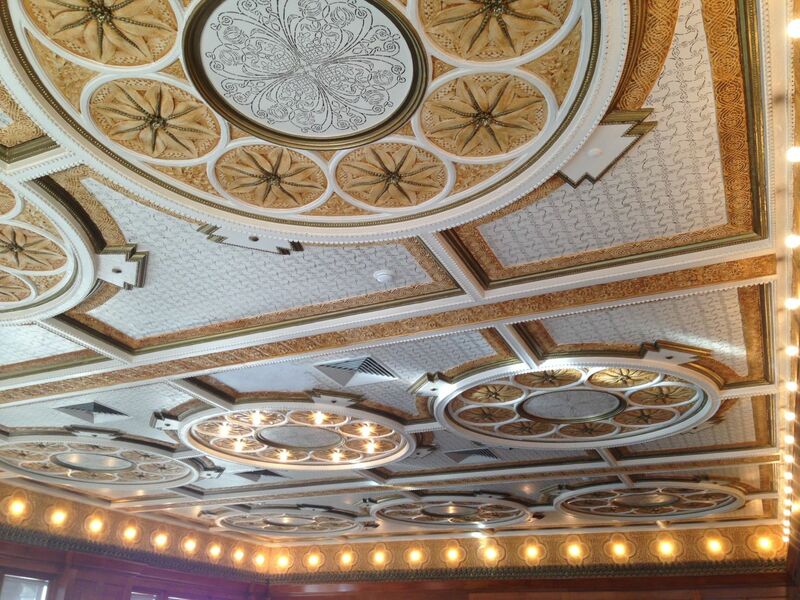 The whole interior is rich with exquisite details. ABOVE: The Auditorium Building. It is hard to believe that humans were once capable of creating such beauty. ABOVE: The Auditorium Building. 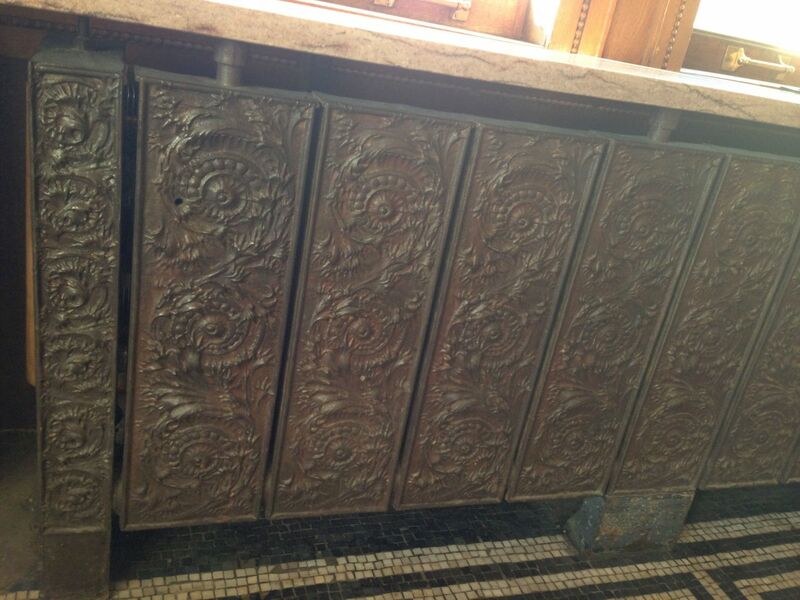 Even the radiators are amazing. It was time to pick up the lighting fixtures I had purchased, so I departed Millennium Park and headed north onto famous Lakeshore Drive. ABOVE: The chandelier is 1950s Mid-Century Hollywood-Regency. And it is huge. 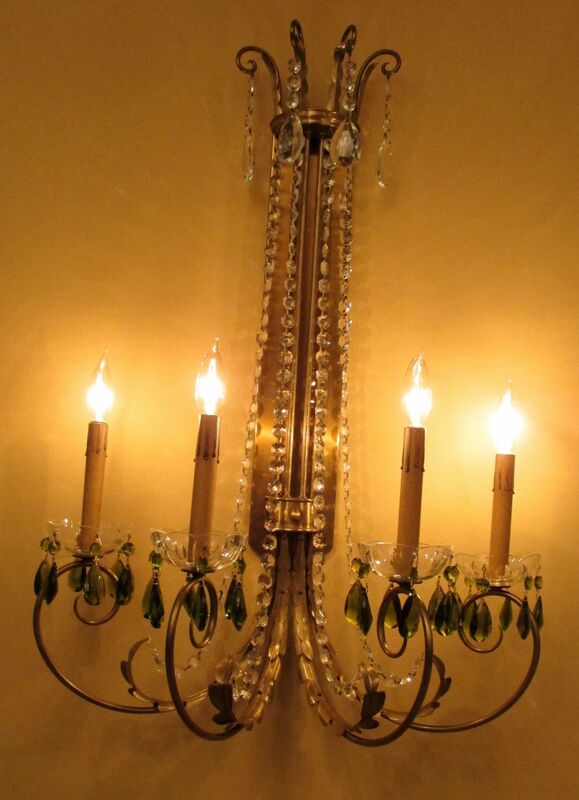 ABOVE: As if the chandelier were not incredible enough, it came with a matched pair of gigantic sconces. I have listed the set for a scandalously high price but not a penny less than such a rare and stunning set is worth. This may be my last road trip. While I used to love running away, since buying the Cross House now I just want to spend every spare minute working on the house. The Chicago trip took three days, and all I could think of was: Gee, I could have finished restoring two more windows for the tower. Well, they say that love is hard. Wow! 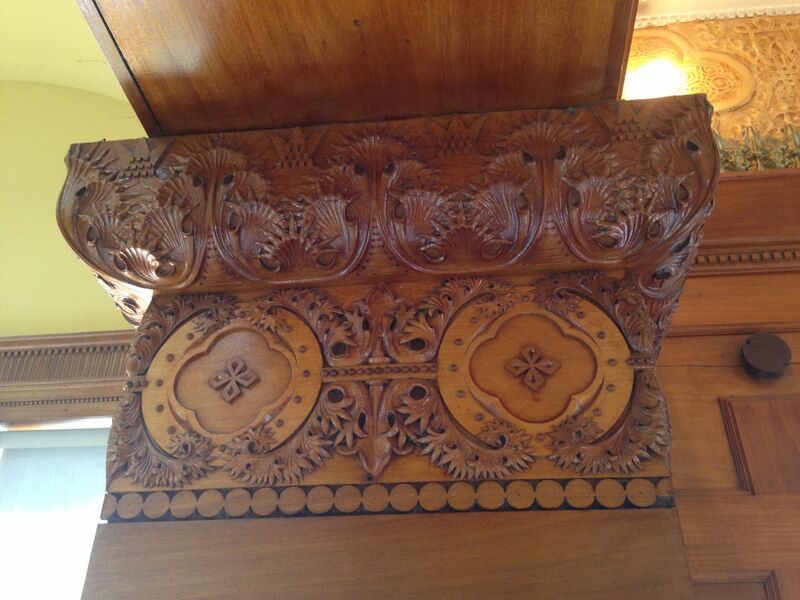 Those carvings are magnificent! Thanks for this post, I really enjoy seeing what most people will never stop to appreciate. I’ve looked around this part of the country for retro motels but they are either in questionable neighborhoods or are so retro even the bedding is original, which is kinda gross when you think about it. I have long thought that some smart person should create a motel brand like, i dunno, RETRO MOTELS. Kinda like Best Western, which does not normally own the motels carrying the brand name. Then fabulous old retro motels would could become licensed RETRO MOTELS after agreeing to X standards and conditions. 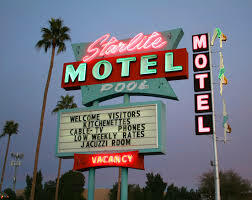 This way, people like you and me (and many more, no doubt), could just just book a room via retromotels.com and be assured that they would be getting an authentic retro motel, and with X quality standards in place. No original bedding! Yes! That actually would be pretty awesome! I kind of want to bid on retromotels.com, maybe you are on to something! This was so very interesting. Thanks for sharing your adventure and the amazing pictures! 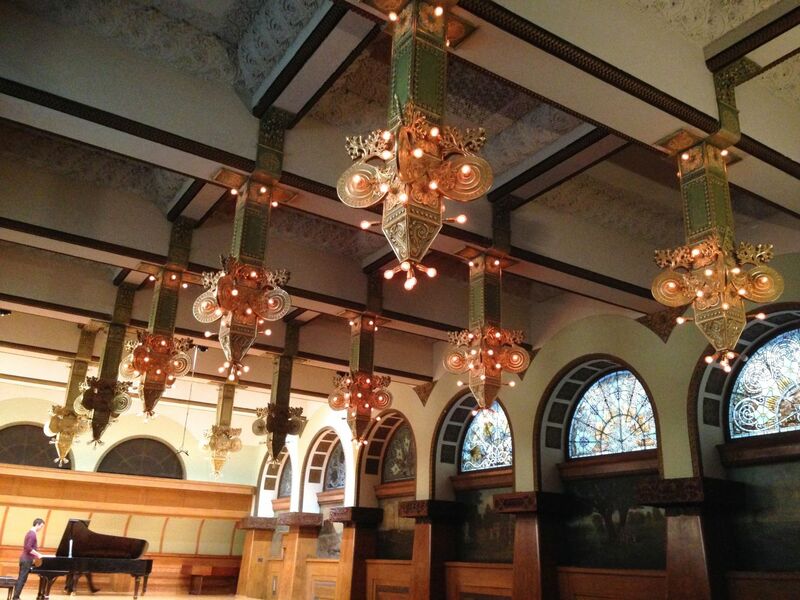 Those Ganz Hall light fixtures are truly wonderful – it seems the more you look at them, the more there is to see. (I don’t guess you could score one of these?) Vinoy Park Hotel – well, the vintage photos were the best IMHO; although the new look is very bright and clean, which I guess is an atribute for this type of establishment. Next? I, too, love my vintage images of the Vinoy Park. They are actually HUGE postcards, and are hard to find now. I have had them since I was like 18! 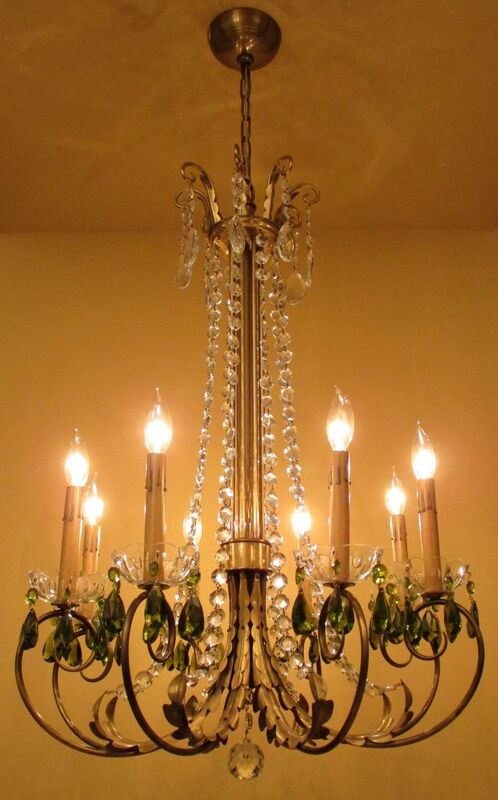 When I was young, I owned one of the chandeliers from the fabulous Pompeii Dining Room (one of the smaller fixtures you can barely see at the side of the room) and it was gorgeous. Tragically, I sold it during my first year in NYC (1980) because I was stone broke. I regret this still, and for years have had an eBay search for VINOY PARK with the idea that a matching chandelier (there were at least a dozen) will pop up one day. I had lunch with David, and it went on for hours and hours! But then I had no time for his exhibit! Poo! Wow! Amazing! Thank you for sharing such beauty. Back in the 70s, I lived in Marseille with my Mom’s side of the family. She worked for Air France, so my folks would usually come out for Christmas, or Spring break. Since Mom was well connected, in the airline business, we always stayed at really upscale hotels when we traveled. I met them in Paris, for my spring break, and we stayed at the Ritz, in the coolest suite ever. They actually brought my water up in a silver bucket, with Baccarat stems! So, the Concierge takes us on a tour of the Hotel, including Coco Channel’s apartment. She had passed away, but the apartment was still cleaned, and just as she left it. My Dad took great shots of the entire place, I got to sit at the edge of her bed, of my Mom opening her closet, me at her desk…and as we were getting into the elevator, Dad realizes…his lens cap was on the entire time. I sure miss my crazy old Dad. And the pictures that were never taken!